“Nistisimes Syntages” are the Lenten recipes the Orthodox can eat during fasting periods. The Orthodox religion has a lot of fasting periods. The period of the Great Lent starts on Kathara Deftera (Clean Monday) and this period is called Saracosti. During the period of Saracosti the faithful fast for a period of 48 days and not 40, as it is falsely believed: the six weeks of Lent and Holy Week. This is not obligatory and most people fast for a couple of weeks before Easter. The fasting period of Easter end after the resurrection of Jesus. The Christmas fasting period starts on the 15th November and ends on the 24th December. From the 15th November till the 17th December, fish is allowed to be consumed but not on Wednesdays and Fridays, which in any case all Wednesdays and Fridays of the year are fasting days. The fasting period before the Assumption of the Virgin, starts on the 1st of August and ends on the 14th of August and of course there are many other days when fasting is part of our religion. Meat and animal prod­ucts (cheese, milk, butter, eggs, lard), fish (meaning fish with backbones), olive oil and wine (all alcoholic drinks) are not consumed during the weekdays of Great Lent. 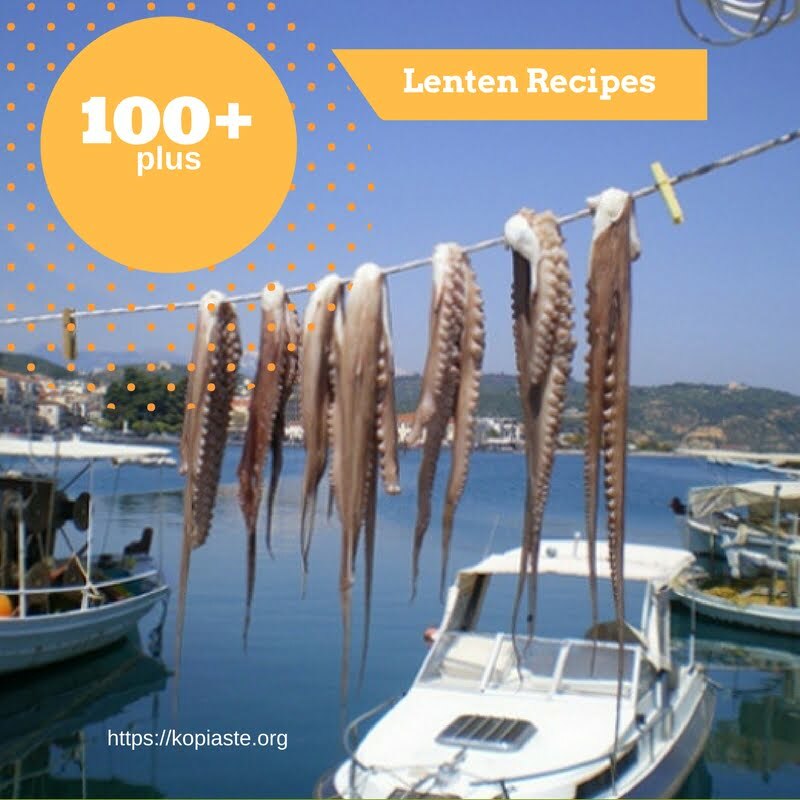 Octopus and shell-fish are allowed, as is vegetable margarine, shortening, and vegetable oils, gelatin, olives, as well as honey are allowed. On weekends, olive oil and wine are permitted. Fish is permitted only on two Sundays during the Lenten period: on the Feast of the Annunciation (March 25) and on Palm Sunday (one week before Easter). The purpose of fasting is to cleanse the body as well as the spirit in preparation for accepting the Resurrection at Easter, which is the most sacred of all observances in the Greek Orthodox faith. During this period I shall try and post mainly Nistisimes Syntages (Lenten recipes). However, I do have lots of recipes I have prepared before Lent, which I shall also post. I apologize if in some of the links you do not find some of my Cypriot recipes. This means that they have been included in my cookbook and had to be removed. You can find my Greek recipes in my cookbooks «More Than A Greek Salad» and«Mint, Cinnamon & Blossom Water, Flavours of Cyprus, Kopiaste!» both available on all Amazon stores. Read more here. A great collection of recipes! Everything looks so yummy! Ivy, that’s quite an array of Lenten dishes and food for thought for those looking to add a new dish to the Sarakosti trapezi. Bravo Ivy! A nice introduction to the Lenten period AND a very wide assortment of nistisima foods. One could craft their entire Lenten menu from this collection alone! Impressive. Wow, what a great round up of Lenten dishes Ivy! So many great things to choose from here, you don’t feel like you are giving much up! Kali Sarakosti kai xronia polla! What a wonderful collection of recipes! Everything looks so unbelievably delicious – no deprivation here! The theme is Desserts over a century old, and I know a lot of the recipes you cook and post about here are traditional dishes. I would be so delighted to learn a 100+ year-old Greek dessert recipe, or anything else you feel like cooking up. Hope to see you there this month! Phew! Who said Lenten foods were boring or limited? That looks like quite an array Ivy! B/w you and the other couple of lenten blogs, I have my entire menu for all of Lent planned out!!! I can’t wait to try some of these Ivy!!! Wow this is what i call a feast, wow wow wow. That’s quite a delicious storm you’ve cooked up Ivy! HOW DID YOU MANAGE? Kudos to you Ivy this is such an awesome Lenten array of dishes!! So much variety to choose from and which one to start with – a feast to my eyes! I read with interest your description of the Lent traditions. The array of dishes is amazing. Looking forward to exploring some of them. Nice collection of recipes. The shrimp risotto looks really good. I will be preparing some meals for lent as well. Wow Ivy – and what will you cook for tomorrow (hahahaha). I love these customs and how people can change and do things they don’t normally do when they feel purpose. Beautiful array of yummies. This is absolutely wonderful, Ivy. Thank you posting these lenten dishes. I’m going to make fakes soupa tomorrow. Take care! looking so delicious and easy to make, thanks for sharing such a wonderful article.